I’m in the middle of kind of a weird food week. Gabe and I are back from a weekend of camping, but we only have a few days at home before jetting off to California for his brother’s wedding. So aside from one glorious meal of homemade pesto featuring the first crop of my miraculously growing basil plant (wahoo! ), we’ve been eating sandwiches and takeout. Meal planning can feel like just one more chore sometimes, but I know I’m so much calmer, healthier, and less impoverished-feeling when I know exactly what we’ll be eating everyday and don’t have to depend on a nearby restaurant. Last week was a pretty successful week in that regard, and I kicked it off with this fun and unusual flatbread. I mixed the dough up before heading off to work, so it rose in the fridge all day and was ready for toppings come dinner time. It’s amazing what a little advance planning can do. Make the dough: In large bowl, stir together yeast and warm water. Let sit for 5 minutes, or until foamy. Stir in olive oil, salt, and flour until dough comes together. Knead on a lightly floured surface for 6-8 minutes or until smooth. Place dough in a lightly greased bowl, cover, place in a warm location, and let rise until doubled, about 40 minutes. Punch down dough, cover, and refrigerate at least 6-8 hours or overnight. Remove dough from refrigerator and let sit at room temperature for about an hour. Preheat oven to 450° F. Prepare two cookie sheets by lightly greasing with olive oil and sprinkling with cornmeal. Divide dough in half and roll each section into an oval about 7×13 inches. Place each oval of dough on a cookie sheet. Lightly brush dough with olive oil. Top with shredded parmesan and red peppers. Bake flatbreads for 8 minutes. Remove from oven. One at a time, crack an egg into a small bowl, and then slide the egg out of the bowl onto the flatbread, until each flatbread has four evenly spaced eggs. Sprinkle lightly with salt and pepper. Return flatbreads to oven and bake until eggs reach desired doneness, about 5-8 minutes. Meanwhile, whisk together 1/2 Tbs. olive oil with vinegar in a large bowl. 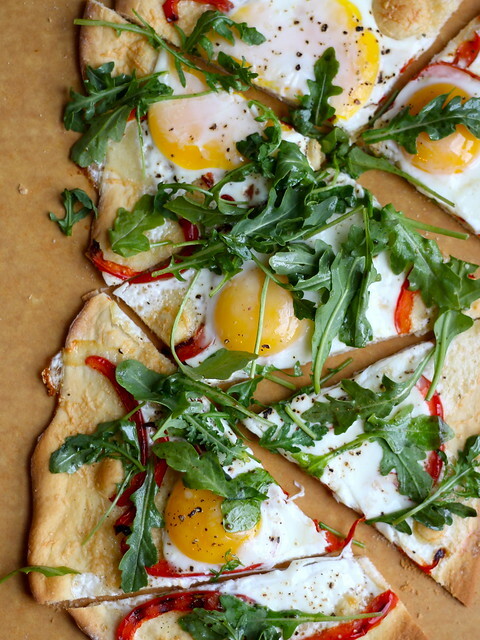 Toss arugula with dressing until well-coated, and then top the baked flatbreads with the arugula. Cut into wedges and serve immediately. Source: Slightly adapted from Williams-Sonoma Eat Well. This entry was posted in Appetizers, Main Dishes, Pasta and Grains and tagged cheese, eggs, healthy, vegetables, vegetarian by krista. Bookmark the permalink. That looks breathtakingly delicious. I…..will…..be….right……over. Oh my gosh! That looks soooo good! I’ll make some for you when you get back from jolly old England! That is a GORGEOUS photo! I want to make this just so I can stare at it!!! And I love eggs on anything–brilliant idea!